Hello Ladies and Gents, please, I need some advice on buying a tractor. Here’s my situation: I recently purchased 23 acres, 5 acres are covered in big hardwoods which I plan on leaving alone, 2 acres are already cleared for a home site, that leaves 16 acres covered in very thick brush and small pines about ten feet high, which I want to clear. Also, I have about 1,400 feet of a private circular drive I have to maintain. In addition, I have to help two other property owners maintain a 2,000 foot private road that leads off the County Road. I will be maintaining a substance garden/farm on this property. My neighbors own New Holland tractors because there is a dealer in the area; however, we also have a Kubota and Mahindra dealer in the area. Any advice would be greatly appreciated. I'd say you are looking at a minium of 30 Hp on a medium sized tractor, not the mini's. That way you can run a bush hog on the rear, use it for finish mowing, pull a box blade for drive maintenance and have a loader for the fun of it. You'll also have enough power for a front blade or snow blower if snow removal is a concern. I wouldn't tackle a 10ft pine with the tractor. I'd cut it down first. I'd seriously consider getting one with the MFWD as that front wheel assist can get you out of jams. I went from an old 2wd tractor to the MFWD and I won't go back. Course, I can turn mine on and off as needed. As for gear vs hydro, I went from gear to hydro and I love the hydro. I can make quick speed adjustments based on changing conditions like backing off slightly if I'm bogging it down when pulling the box blade, etc. Thanks for the quick reply. I looked up the Hydrostatic transmissions and that sounds like it would save a lot of shifting. I assume MFWD means Modified Four Wheel Drive but, what’s the difference between FWD vs. MFWD? I’m really ignorant about modern tractors; thus, I appreciate your patience. MFWD Mechanical front wheel Drive. 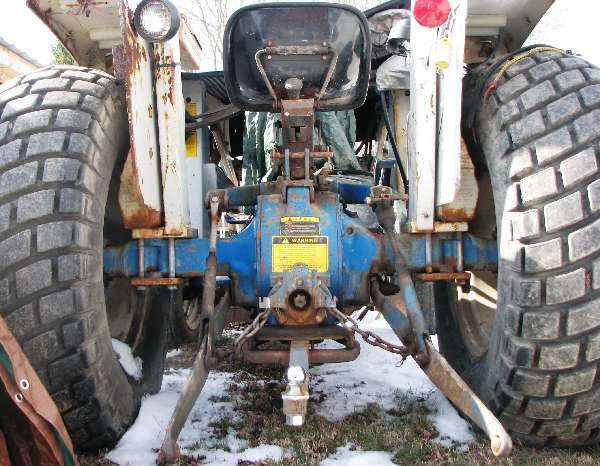 Years ago a couple of manufacturers tried to convince the world that it needed Hydraulic drive on the front end. Gear drives were first introduced in the mass production in 1951. Look st the New Holland Tc40 or 45DA's. Or the Kubota L series. Both are very good tractors at affordable prices. Many thanks to all who replied. I have a Kubota, John Deere, New Holland and Mahindra dealer with-in 45 minutes of me so, I have a lot of choices. I guess what I will do is decide on the type of tractor I need along with the attachements I will need and visit each one to see what kind of package deal I can get and of course check out the service departments. Oh, almost forgot. When I was in the Armed Forces many years ago we hauled all of are munitions with Ford Tractors. I was at one site for four years where we had four Ford Tractors, not once did any of these tractors fail to start nor did they ever break down so; did Ford stop making Tractors? Ford sold off their tractor division to New Holland, so these days if you need parts for a Ford tractor you go to NH. As you progress on your tractor quest (and a noble quest it is), you will get opinions on which brand is best. Blue, red, orange, green, foreign, domestic, etc. All will make a unit that will work for you. Focus on the service and dealer quality. Then go with the one you feel most comfortable with as far as brand, reputation and dealer. So if something does go wrong, the dealer will be there and stand up for you. Thanks Lowafun, after sale dealer service is my top priority; however, ride comfort is also high on my list as I have knee problems. Our local Kubota Dealer has a 2002 JD 790 (w/FEL) for sale with 126 hours for $13,000. That seems like very low hrs and a decent price, makes me wonder if that year and model had problems. Still, I think I will go new so I get the latest in ride comfort. I wouldn't sweat used too much if it was well taken care of. I've got a 2004 year JD 4310 and it has an adjustable seat. I can adjust it for weight, height, forward/back, etc. Pretty nice. But a 2002 790 wouldn't be bad at all. But take a look and see if the seat is as comfortable as the new machines. These are tractors afterall so they don't have a suspension other than the tires and the seat. I like my tractor so much, that I'd keep it even if we hadto move back into a subdivision. It may not take me much time to mow a 1/3 acre lot with a 72" deck, but I'd be the envy of every guy in the neighborhood!